The first print workshops for 2018 commence in April and there is much more to come with Inkfest Festival of All Things Print just around the corner. InkMasters Cairns offers a range of print workshops for artists at all levels, for artists new to print and old hands! 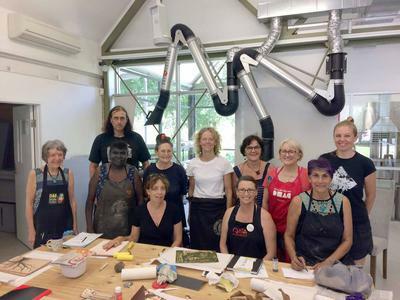 The workshops provide a great opportunity to learn from InkMaster artists and invited senior printmakers in a range of techniques. In each workshop you will explore, step by step, a range of methods for creating striking images on either paper or fabric, giving you your very own amazing original hand-made prints. Maximum number of students in the workshops is 10, so individual attention is assured. Materials are included in the fee and you will be printing on high quality rag paper. Completed prints may show in the exhibition Prints from the Workshops at Tank 4 27 Jul-19 Aug.
You will be working in a state of the art printmaking facility, with eight presses. The workshop space is also available for hire to individual artists and groups for very reasonable rates. 1. 9-21 May Intaglio (Etching) with Master Printer Elizabeth Hunter. 7 x weeks x 3 hrs Mon 6-9. Suitable for beginners to advanced and including the techniques of etching, spray aquatint, hard and soft grounds, white grounds as well as additional techniques to enhance the print, e.g. collagraph and chine colle. It is very exciting as we can, for the first time, offer both long and short term workshops to accommodate requests from our members and visitors. The addition of long term workshops will enable participants to gain in-depth skills, with time to develop plates or blocks both in the studio and at home. The workshops are delivered at our state-of-the-art print workshop at 55 Greenslopes St, Edge Hill, Cairns 4870.